The Annual SRU-SCNRA U18 Inter-Tertiary 15 A Side Tournament kicks off on 10th June. The tournament will also provide the SCNRA to identify potential players for the respective NRA age group programs coming up later this year. The tournament will see different 4 combined teams taking on each other, Singapore Schools A (U18), Singapore Schools B (U16), Combined ITE, Combined Polytechnic Barbarian. With both Singapore Schools teams taking the top 2 position in last year’s tournament, can they retain their titles this year? 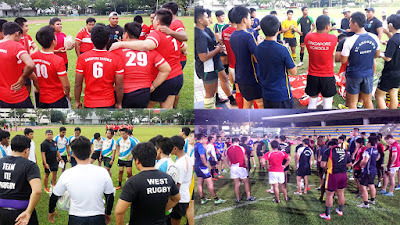 Singapore Schools U18 and Singapore Schools U16 Team. The Singapore Schools teams are made up of elite players all over singapore and is under the Singapore Schools Sports Council. The teams are assisted by Mr Sidney Kumar from Saint Andrews Secondary School and Mr Romi Musa from Raffles Institution. With the SRU assisting with the coaching, by Standard Chartered Bank Rugby Development Officers Ashraf Nasser and Alvin Ho. Combined ITE U18 Team. The Team combines ITE College East, ITE College West and ITE College Central together. Having just won the SRU Tertiary 7s recently and overcoming SIM University in the Finals, the team shows that age didn’t matter for them. Coach by Head Coach Yazid Rosli, Coach Farij Samsudi and with assistance from SRU’s Senior SCRDO Soh Zi Chun. Having gotten 3rd in last year’s SRU-SCNRA U18 Inter-Tertiary 15 a side tournament, this year’s ITE Team will be looking to continue their high spirited momentum into this tournament. Combined Polytechnic Barbarians U18 Team. The Team this year brings together players from the Polytechnics, Private and International School. Coming in 4th place last year the team seeks for an improve performance this season. Managed by SCNRA Manager Gaspar Tan along with NRA U19 Head Coach Hadizan and SCRDO Rex Wang. NextPartnerships: Emirates Comes on Board!